“Black Sea” is an underwater heist film with an allegiance to blue-collar values that cruises along like a submarine unable, or unwilling, to rise to the surface or dive deeper into the depths of cinematic inspiration. For every clever plot twist or genuinely strong performance in “Black Sea,” there is a strong helping of predictability which counteracts the surprise and at times leaves the film feeling reluctantly inert. 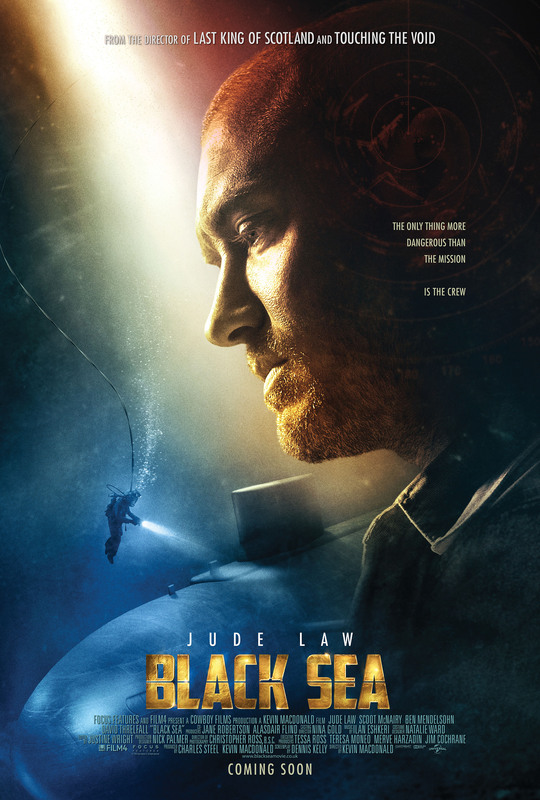 In the opening scene, we meet commercial submariner Captain Robinson (Jude Law) as he is getting a slap-in-the-face severance check from his job of 30 years. After licking his wounds with some old drinking buddies, he is tipped off to a potential deep sea fortune worth millions of dollars in lost Nazi gold hidden at the bottom of the Black Sea in an old U-boat. Driven by his hatred for the upper class elite and a longing for his son and ex-wife, Captain Robinson assembles a charismatic crew of Russians and Englishmen (all promised an equal share of the gold) to help him on the voyage to uncover the lost treasure. Director Kevin MacDonald does a fine job allowing the actors to search for depth in what are essentially formulaic supporting roles. As Captain Robinson, Law (doing his best with an Aberdeen accent) once again proves himself worthy of the character roles he is pursuing now that his pretty-boy face is no longer winning the battle against his receding hairline. Many other strong performances emerge throughout “Black Sea.” The role of the initially quiet Morozov is compellingly played by Grigoriy Dobrygin. Unfortunately, there just isn’t enough of him in the movie. “Black Sea” is a solid choice for submarine sub-genre fans looking to get their underwater fix or the casual movie-goer hoping to see deep sea claustrophobia splashed across the silver screen, but for those hoping for the next “The Hunt for Red October” or “Das Boot,” well, don’t hold your breath.